Old dogs are the best dogs. I wonder if I feel this way because I am getting old older myself. Don’t get me wrong, I love all dogs, but an older dog is an extra special dog and old dogs are the best. I don’t know yet if old cats are the best cats. Ninja is the first cat Dear Hubby and I have had and she’s not yet old. I am still learning about life with cats. If you’re a cat person, you’ll have to let me know if old cats are the best cats. My life has always had dogs in it. My entire family loves dogs. You might even say we’re a bit dog obsessed. One of my aunts used to joke around saying, that besides the damn brca gene mutation, our family must have some sort of dog lover gene mutation too. It was far more amusing the way she put it, but you get my point. We love dogs. Dear Hubby and I don’t think it’s odd at all to travel from Wisconsin to California to pet sit our grandsons. Yep, that’s what Dear Hubby calls Dear Daughter’s and Dear Son-in-law’s two dogs and two cats, our grandsons. (We have two more grandkids of the feline sort residing in Minnesota). Recently, we made such a trip. We only saw Dear Daughter and Dear Son-in-Law for a few hours on both ends of our visit; we had ten days with the animals. That’s the way we roll sometimes. Let me just say, taking care of an active weimeraner pup and a senior dog with more than a few medical issues and two cats is fun, but it’s also a lot of work! I have even greater respect for you pet sitters and pet walkers after that gig. Ace, aka That Mutt and one of our California grandsons, is an old timer. He’s nearly twelve which is old for a large breed. Ace sees no need to hurry these days, so he doesn’t. Ever. He moves slowly. I mean really slowly. He’s got that meandering thing down pat. Old dogs remind us that hurrying is over-rated and often completely unnecessary. Old dogs are the best dogs. Naps are serious business, too. As they should be, right? Just a couple old timers napping. 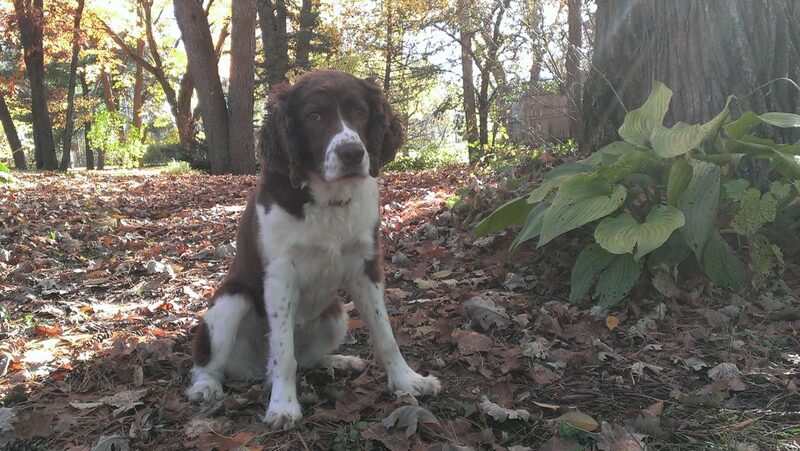 As I’ve written about before, our golden Elsie and English springer spaniel Sophie will forever hold special places in my heart because they helped get me through tough times. When my mother was dying from metastatic breast cancer, Elsie and Sophie brought the kind of comfort only beloved pets can. The special memories of Elsie and Sophie and other family pets visiting my mother during her final days are some of my most cherished. Our family pets were not certified therapy dogs, but they were therapy dogs nonetheless. And of course, Elsie and Sophie were my eye witnesses and secret keepers, the only ones with me when I heard those words, you have a cancer. 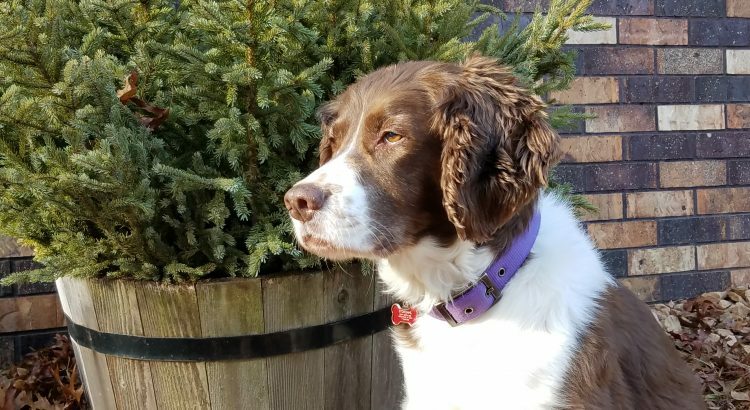 More recently, Sophie visited my dad in his assisted living apartment and later in his hospice room, once again delivering the kind of calm and comfort only she could give. Sophie’s almost twelve now and like Ace, she’s considered an old dog. Her body no longer cooperates as it once did to match her exuberant spirit, but she’s still Sophie in every way that counts. I love her in a way that fills my heart, but also reminds me I should probably begin readying myself for that day; that day which will come far too soon. But for now, I relish the time, hopefully the years, we still have together. Sophie is why I see more clearly every day that old dogs are the best dogs. Every dog that’s made its grand entrance into my life so far, did so as a wiggly, tail-wagging, naughty but impossible-not-to-love pup. Good thing puppies are cute, right? Without a doubt, there’s nothing like watching your new-to-this-world furry bundle of energy, mischief, cuteness and love nuzzle its way into your family’s lives. But old dogs are the best dogs. By the time most dogs are old, they have grown into mature, content, wise, trust-worthy, dignified, faithful companions. But it’s more than these things. Old dogs have weaved themselves into our lives and into our hearts. They’ve learned to understand, even anticipate our moods, our routines, our expectations, our everything. Old dogs know us; they really know us. And they love us anyway. 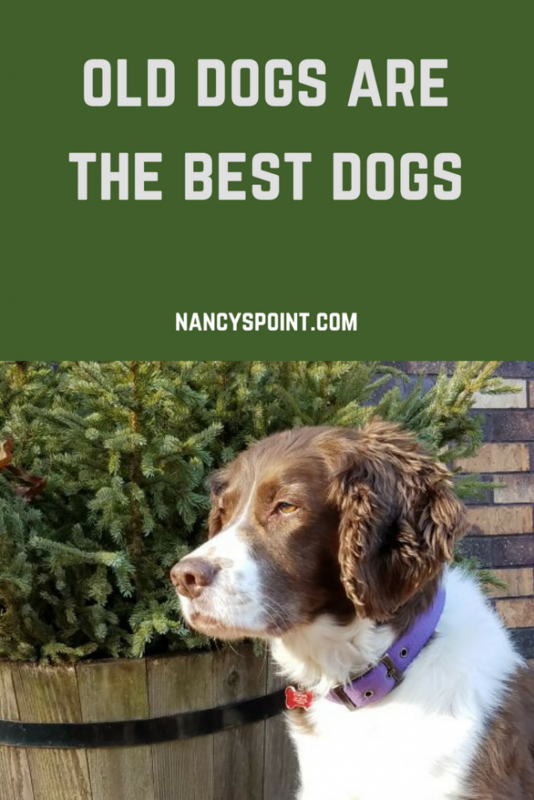 Yes, old dogs are the best dogs. Do you have (or did you have) a dear old dog you’d like to share about? If you’re a cat person, do you think old cats are the best cats? What kind of pet do you have now, if any? Become part of my inner circle. Keeping it real. Support you can use. Aww, thanks for including Ace in your post. Nice pictures of Sophie. I also think the senior dogs are the best dogs. Lindsay, There was no way I could not include Ace. 🙂 He’s another reason why I firmly believe old dogs are the best dogs. Thank you for sharing. I really loved reading this post. It is a blessing to have animals in our lives. I’ve never owned a dog, but I love dogs. I’m a definite cat person, though. My kitty Cosette lived until she was 17; as you know, cats tend to have longer lives. I’m not sure whether old cats are the best cats. In many ways, old cats are wonderful; they, too, slow down and nap more than play. They often prefer cuddling with their pets (us humans) on a comfy chair. With cats, the whole world is their bed. They sleep on ANYTHING, as you’ve probably seen. Like your dogs, Cosette was a therapy cat, helping me through cancer and its treatments. Cosette faithfully stayed by my side through it all. She sensed my fear and all the other emotions that come with cancer. I miss sleeping with her every night. I think senior cats become extra special too just because by then they’ve shared so many memories with us. Plus, they live so long they are there for so many events and changes in our lives as well as just everyday habits and routines. It will be hard for me when my senior cats die. They are about 14 and 12. I’ve never experienced losing a cat before. Beth, Having animals in our lives is a blessing for sure. I can’t imagine ever not having a pet. I love how cats tend to live longer, but of course, it’s not long enough either. I know how special Cosette was to you and how much you still miss her. I think it’s amazing how much Hemi looks like Ninja, btw. Thank you for reading and for sharing about your love of cats. I’m still learning about life with cats! I adopted my feisty Shichon (Shih Tzu/Bichon Frise) when she was ten, and she’s twelve now. She’s my first dog/pet, and I could not love her more. We recently celebrated our two years together, and I hope to celebrate many more anniversaries with her. JY Kim, It’s wonderful you adopted a pet, and it sounds like she’s won your heart. Pets tend to do that. I hope you have many more anniversaries to celebrate with her too. Thank you for sharing about your sweet friend. I am not a cat or dog person, I guess you could say I am an animal person. We have two senior cats, a Himalayan and a crazy playful Calico we adopted as a kitten from the Humane Society. We also have a two year old Shichon, an Anniversary gift from my Dh who really didn’t want another dog, she won him over in a heartbeat, it took the cats a while longer to adjust. Laura, It’s great fun to watch the interaction between dogs and cats, isn’t it? Well, usually. ha. Thank you for sharing about your animals. They sound wonderful. I love this post, Nancy. I am a dog person. I just love them. Our dog Wally is not a senior, he’s almost eight. I do hope we both live to a ripe old age. 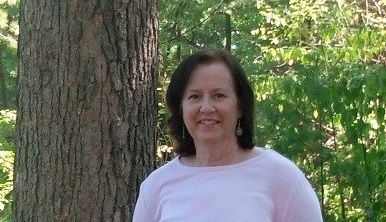 He has been with me since my first breast cancer diagnosis, and has helped me get through the highs and lows. I can’t imagine life without him. Susan, Thank you so much; I’m glad you loved this post. Dogs are such wonderful companions, as you know. I always love seeing your photos of your sweet Wally. I hope you both live to a ripe old age too. I have a pretty good idea just how special he is to you. Thank you for taking time to comment and share about Wally. This is a wonderful post. 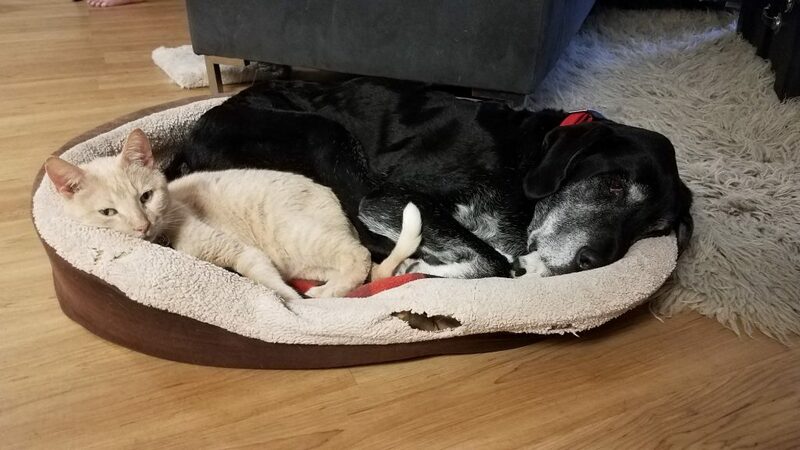 I love all animals and I’ve been lucky enough to have cats and a dog (all rescues) who lived with me well into their senior years. Two of my cats lived till they were 17 and my beloved mutt Maggie made it to 13 before cancer took her. She was my “dog of a lifetime”; 80 lbs of the gentlest, kindest, sweetest, soul you could ever meet. Maggie saw me through cancer before her old body gave out and she left this world. I will love her till the day I die. The lovely thing about senior pets is their daily joy at just being there in the moment with you. They no longer seem to look at you as a mere conduit to food, squirrels, frisbees, or runs in the park. As Maggie aged I felt like I had been accepted as a partner rather than a mere dog owner, and we decided our days together rather than one of us forcing the issue. I still miss my girl but there are so many homeless dogs out there that need homes. I’ve already decided that when the time comes I will be looking for a senior. Aww, so many senior dogs looking for homes. It would be so rewarding to adopt one. Lennox, I’m glad you liked this one. Your sweet Maggie sounds just wonderful. Thank you for sharing about her. When the time feels right to open your heart and home, there will be another senior dog to love and to love you as well. This is absolutely the truth, Nancy. Your dogs are beautiful. My sweet dogs are now gone, but they were such a blessing in my life. Bonnie, a borador, and Beau, a Boxer, were my therapy while I was going through chemo. 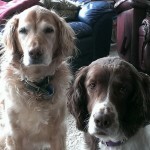 Bonnie was 10 and Beau was 8 when I was diagnosed with cancer. They didn’t need to do anything except just be themselves – loving, peaceful, happy to spend time together. I know they understood that I needed them, and I don’t know what I would have done without them. I miss them both terribly. One of these days, another dog will come along that I won’t be able to live without. Cathey, Elsie, our golden, is gone too now. We miss her so much. As you said, I, too, love how our pets don’t need to do anything other than just be themselves – loving, peaceful, happy to spend time together with us. That pretty much sums up why they are so beloved. I’m so glad you had your two sweet dogs with you during that rough time. I hope the day comes when you feel ready to open your heart and home to another dog. Thank you for sharing about your Bonnie and Beau. They must have been wonderful companions. My pups aren’t considered seniors yet (they’re both a little over 6), but several of my dog walking clients are older K9 citizens. They just have something extremely wise and gentle about them – I so love taking care of them. 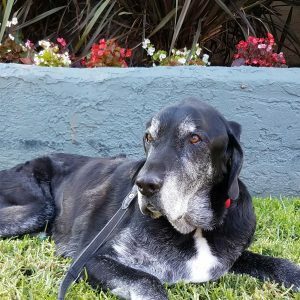 One of my older Great Dane clients passed last year at the ripe age of 12, and I still miss him – sometimes I even dream of him. He had this darling habit of resting his head on your shoulder, and leaning into your face with his head, when you were sitting down somewhere. It was the most adorable, heart warming thing. Brings tears to my eyes now just thinking about it. I actually went to visit one of his Great Dane brothers (from a different mother) yesterday, and I was stoked to see that he picked up that very same habit!! Barbara, It’s sweet you dream of that Great Dane you used to care for. He must’ve made quite an impression. I saw that photo you posted on Instagram of your recent visit with his brother. Very cute he picked up the same endearing habit. You’ve got a great gig taking care of your clients’ dear pets. I have a lot of appreciation for how much work it is, too, though! Have a wonderful 2018 and thank you for reading and commenting. More Than Just a Bowl of Cranberries & Happy Thanksgiving!